Arrow Video seldom, if ever, drops the ball on their presentations and this is no exception. Horror film originality was and is a hard thing to come by. The genre is replete with derivative, and often times, unmemorable dreck. Once in a blue moon, we see filmmakers attempt to push the envelope and try something new. The Chiodo brothers managed to do just that in 1988 with the fan favorite, Killer Klowns from Outer Space. When Mike and his girlfriend Debbie warn the local police that a gang of homicidal alien-clowns have landed in the nearby area (in a spaceship shaped like a circus big-top, no less), the cops are naturally skeptical. Before long, however, reports are coming in from other anxious residents detailing similar run-ins with the large-shoed assailants. There can no longer be any doubt – the Killer Klowns from Outer Space are here, and they're out to turn the Earth's population into candy floss! I seldom enjoy horror-comedy movies but I do make a few exceptions, KKfOS is one of them. The movie provides a great blend of outrageousness, humor and a few creepy moments and ties it all together with sticky-sweet characters that all seem to end up right where they started. The best part of the film is, of course, the Killer Klowns. We can never seem to get enough of them, and thankfully the Chiodo's can't either, as they are on display almost from the beginning of the film, in all their bobble-headed glory. What I love most about this film is that it refuses to take itself seriously, and fully delivers on its absurd premise. Alien Killer Klowns are here to turn you into fun-sized snacks. When I first saw this movie in the theater in May of 1988, I was not disappointed (except maybe by the PG-13 rating) and in this presentation by Arrow Home Video, the fun continues. Arrow provides us with a 4K restoration 1080p, AVC encoded image 1.84:1 aspect ratio. This is the definitive look at this film, in all its lurid and fluorescent glory. From the glow of the Circus-tent Spaceship to the Cotton-Candy-Cocoons, and especially the details of the Klowns outfits and hideously hilarious faces, this movie has never looked better. The set pieces within the spaceship, including the rotoscoping and matte paintings, really come to life here. The one complaint I have is that this is a visually dark film, shot entirely at night, and the exterior scenes tend to become soft and fuzzy, losing their sharpness at times. But it is a minor complaint, as most of the movie is clear and bright. The newly remastered stereo 2.0 and 5.1 DTS-HD MA does a decent job of keeping the film vibrant and alive, but the background music suffers from low-budget sickness, although the atmospherics are decent enough and it does help punch up some of the action sequences a bit. All in all, considering what they had to work with, it all sounds great, if uninspiring. The Extras on this presentation are excellent and endless, with tons of commentaries, interviews with the Chiodo brothers, as well as a history/retrospective of them and how they got started as children shooting on Super 8, The creation of the theme song by the Dickies, and a cool interview of how they came on board, The Tour of the Chiodo bros. Productions, even a behind-the-scenes, showcasing actors in Klown Kostumes, perfecting their wacky walks and mannerisms are all enjoyable. There's also a reversible sleeve, with new artwork, a booklet, as well a mini poster. You'll be here for hours exploring the Killer Klowns Universe, wishing those sequels would blast out of production hell already. Arrow Video seldom, if ever, drops the ball on their presentations and this is no exception. If you are even a casual fan of this cult classic, I suggest you buy a ticket - this is one fun house you will not want to leave, and, if the Klowns have their way, you never will! Download Killer Klowns from Outer Space from the iTunes Store in Digial HD. 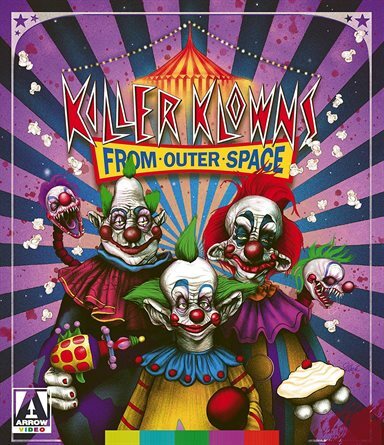 For more information about Killer Klowns from Outer Space visit the FlickDirect Movie Database.